Every month here on the blog I share our homeschool morning basket with you. This basket is specific to what we are studying in our homeschool, and it tends to change on a monthly basis. Today, I’m going to share with you my mother’s morning basket. This basket is different because it does not change monthly, but changes whenever I finish the things I’m currently working on. 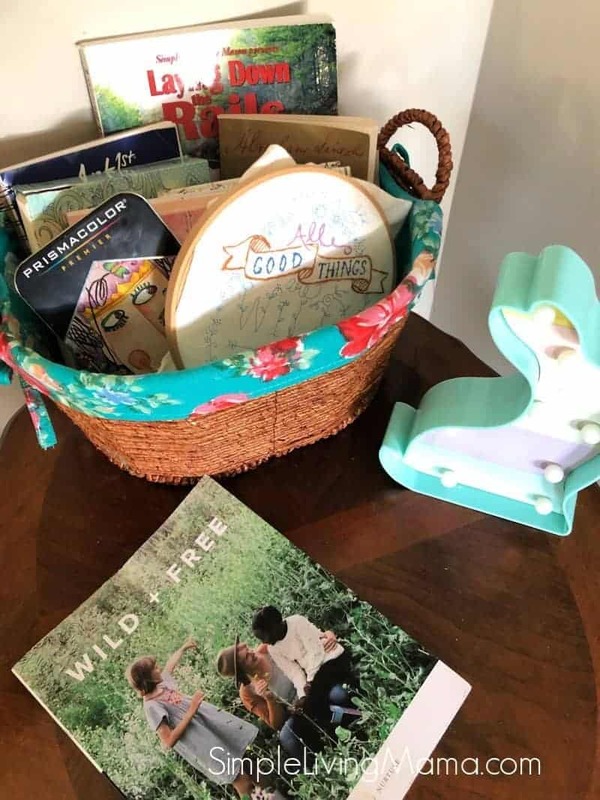 A mother’s morning basket does not have to be specific a homeschool mom. Any mom can implement a morning basket! I decided to implement the morning basket for myself because I wanted a place to keep all of the books and projects I was working on myself. When I have everything together in a centralized location, it seems I am better able to remember what I’m working on and actually do the things! I don’t always do the things in my morning basket in the morning. I will typically do a little reading and planning while drinking my coffee, but I keep my morning basket on an end table and go over to it whenever I have time throughout the day. If I have a few minutes while the kids are reading, I’ll pick up a book that I’m reading, too. If we happen to have a quiet evening and I have a few minutes, I’ll pick up my handicraft to relax. I keep a variety of items in my morning basket. They are mostly books, but I do sneak in some enriching activities. 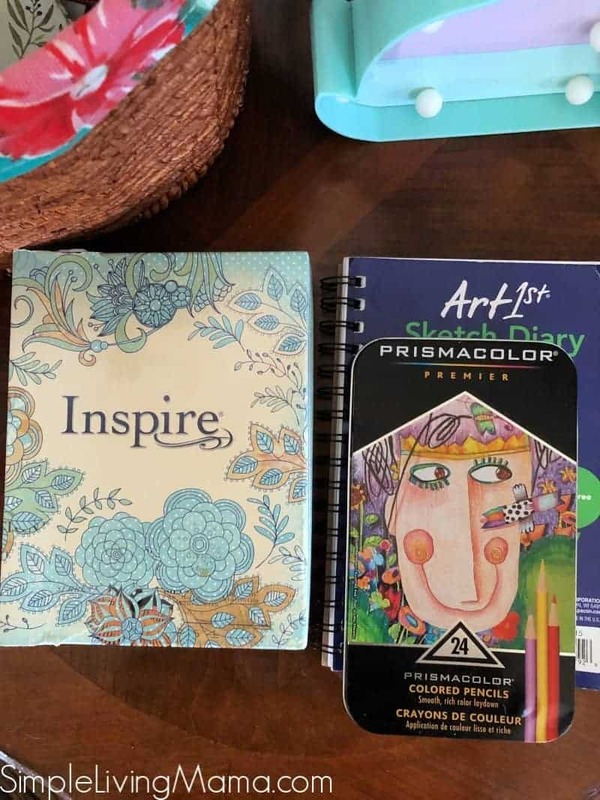 I recently purchased the Prismacolor colored pencils and a set of Prismacolor colored pencils. It’s so nice to be able to add some color to my Bible while I’m reading the word. I also keep a sketch book that acts as my nature journal. Whenever we have a nature outing as a family, I try to add to my journal. I prefer to keep a devotional in my mother’s morning basket, as well. 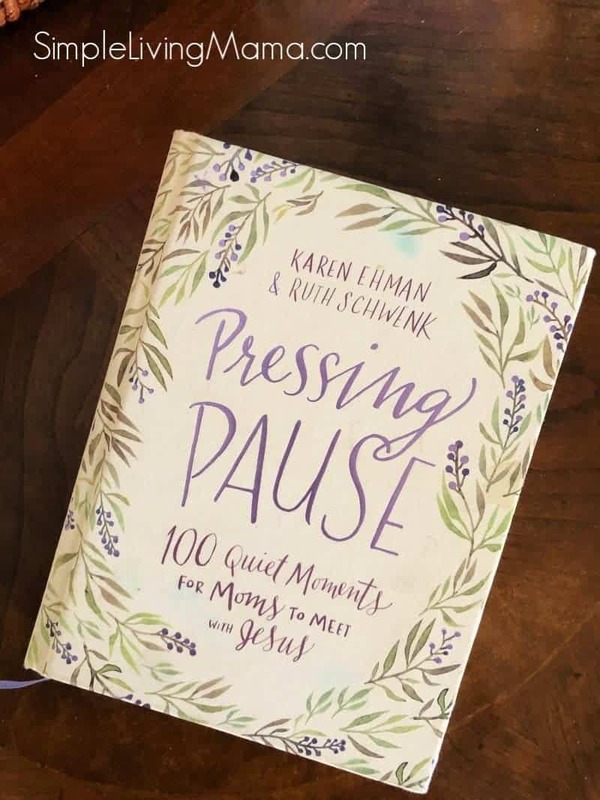 Right now I’m reading Pressing Pause and loving it. Each devotional is really bite-sized and only takes a few minutes to read, but it is powerful. I have my Choose Love journal in my mother’s morning basket to jot down things. I already mentioned that I keep a sketch book in my basket. I like to journal our adventures! Not pictured is my current fiction book, but I have enjoyed reading fiction for just myself. I’m currently reading the Outlander series. I keep a non-fiction book going also. My current read is Abraham Lincoln from The Good and the Beautiful library. I love to read books that educate me in some way. Whether it’s a parenting book, decluttering book, or a book about homeschooling, I try to keep one or two going at a time. 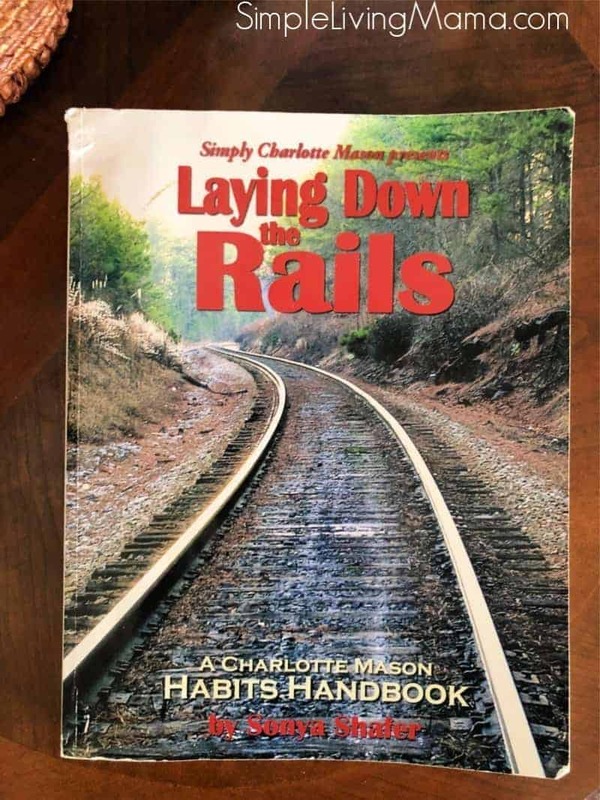 I’m currently going through Laying Down the Rails from Simply Charlotte Mason. I’ve taken up hand embroidery, and I really, really enjoy it. 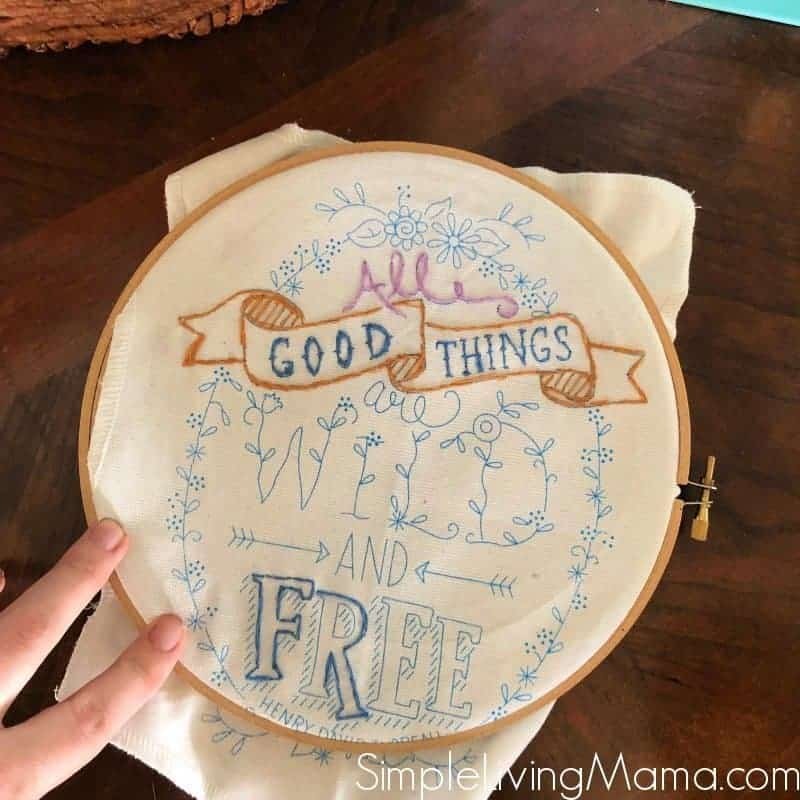 It may take me a year to complete this banner because I admit it’s hard to find time to carve out for this craft with all of my toddlers always wanting to sit on me when I sit down, but I’m doing it! I’m learning and having fun! So, as I already mentioned, I do not change my mother’s morning basket on a monthly basis. It changes as I finish books and projects. It’s so relaxing to me. Eventually I’m going to get myself a special chair to put beside my table! Do you have a mother’s morning basket? 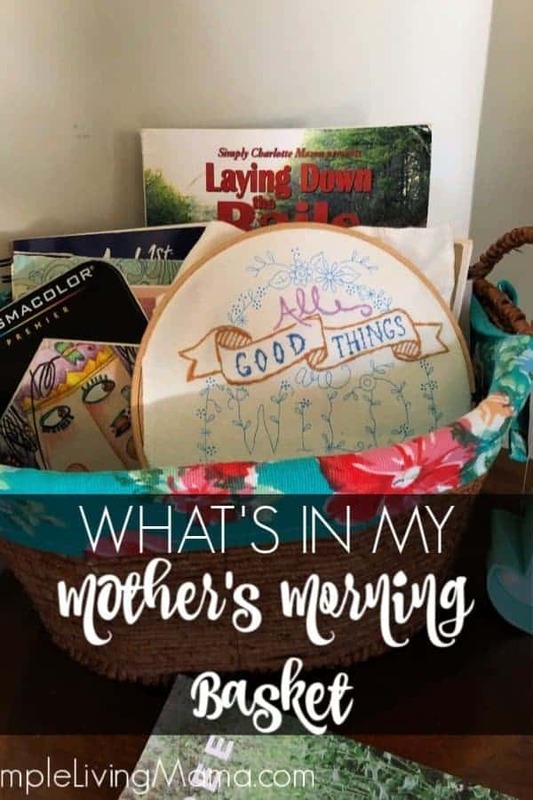 I love the idea of a Mother’s Morning Basket! I think a place in the open to keep all the books I’m reading/want to read in one place with my crocheting would encourage me to use both more. Now I just need to find a basket. Yes! It’s such a big help to me!